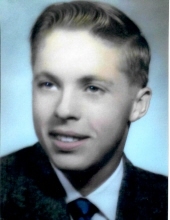 Donald Irving Green of Culver, Indiana passed away April 7th, 2019. Donald was born August 23 1939 to Irving Winfield Green and Milly Mable Eskridge. Donald served in the Army where he obtained the rank of Sargent. He worked as a machinist for in the Tool and Die Industry for many years. Before retiring he spent 25 years at Joy Manufacturing. On June 26, 2004 he married his wife, Shirley Jean Eskridge, she survives. Also surviving are his sons Donnie (Jane) and Randy, his sister Beverly Sue Price (Jim), 7 Grandchildren and 5 Great Grandchildren. He was preceded in death by his parents, his son Christopher, his daughter Rachel, his brother Dennis Lee Green, and his sisters Betty Jean VanDeMark and Barbara Jo Green. Donald's family is holding a memorial service on Friday April 12, with a visitation from 3-5pm(cst), a service will follow starting at 5pm(cst). To send flowers or a remembrance gift to the family of Donald Irving Green, please visit our Tribute Store. "Email Address" would like to share the life celebration of Donald Irving Green. Click on the "link" to go to share a favorite memory or leave a condolence message for the family.